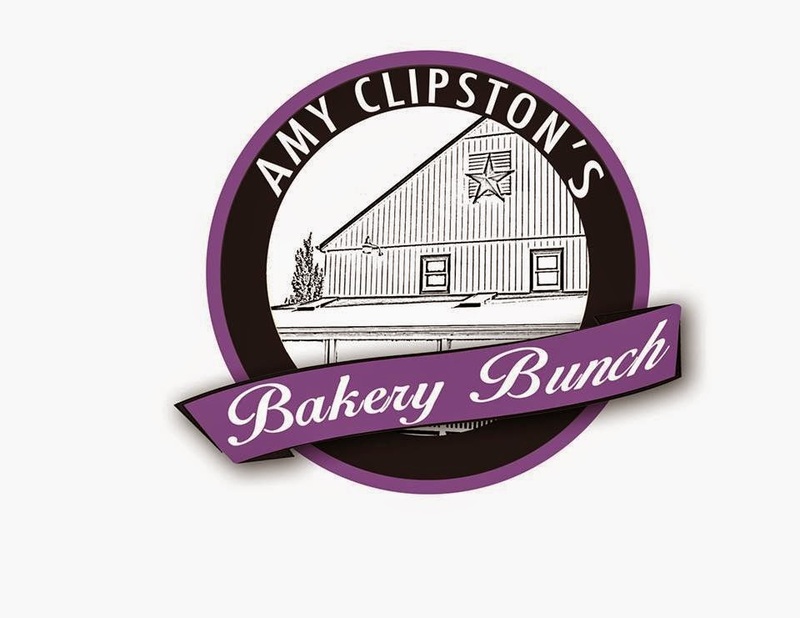 You might be wondering what "The Bakery Bunch" is...it's a great group of readers that are part of Amy Clipton's "street team", helping to spread the word about her upcoming books. Let me tell you...there are some great benefits to being on an author's street team. If you ever get a chance to do so, MAKE SURE YOU SIGN UP! Sorry for the yelling, but I can't stress how much fun it is to work with different authors! The benefits vary, but for this post, I'm going to share some insights on working with Amy. First of all, don't you love this logo? "Jamie", who I might say is very talented, came up with the design for our group. Everything we receive has this logo on it and is associated with the color purple. The picture doesn't do it justice, as there is not much shown, but the purple color is beautiful! 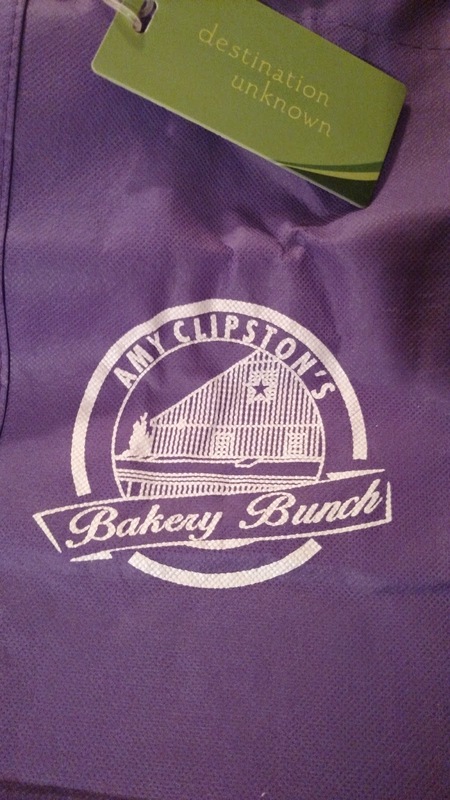 And the front of the bakery reminds me of some of the Amish bakeries in the area where I live! 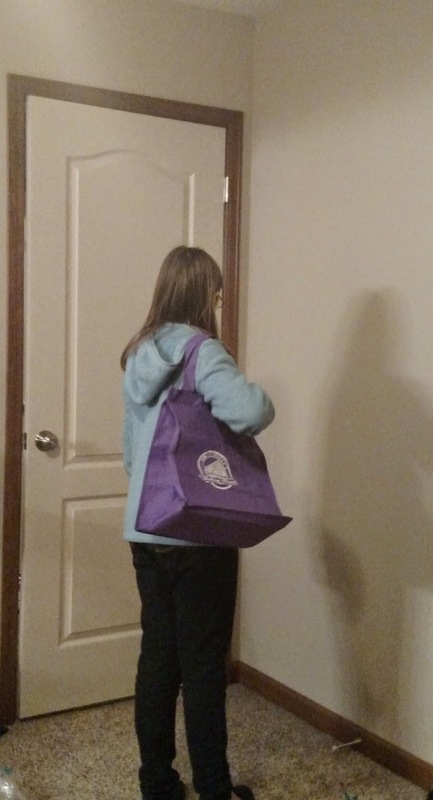 So to start off, we were to be on the lookout for a purple package we would be receiving in the mail. 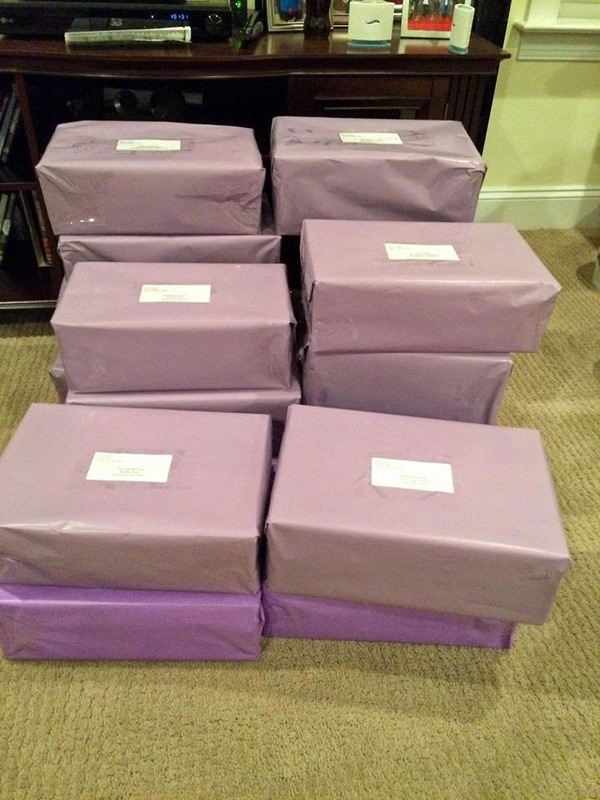 This package would be the holder of all our goodies! I can't tell you how many times I wanted to run home on my lunch hour to check for the package. Especially when the others in the group would post that they had received theirs! The day finally arrived, and I tore in to the package. I digress...I forgot to take a picture of the package, I was so excited to see what all it contained. So, I borrowed this picture from Amy! 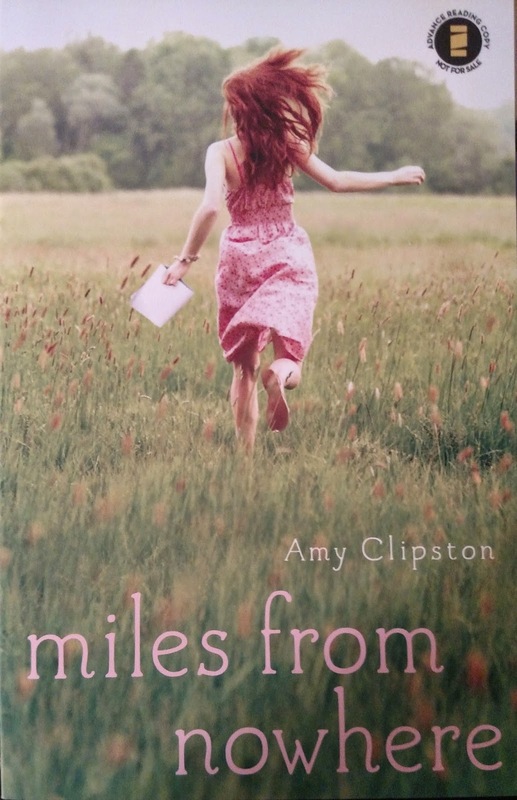 Of course there was an ARC of Amy's upcoming book, Miles From Nowhere, which releases on April 7. With my busy schedule, I have to admit, I just now got around to starting this book. On my lunch hour. Yes, you read that correctly. Lunch HOUR. What was I thinking? Of course I didn't want to put the book down, I'm hooked already. At least I am getting off early today, so I can rush home and continue reading it! My second favorite item is the logo cup we received. In the above mentioned beautiful purple color! 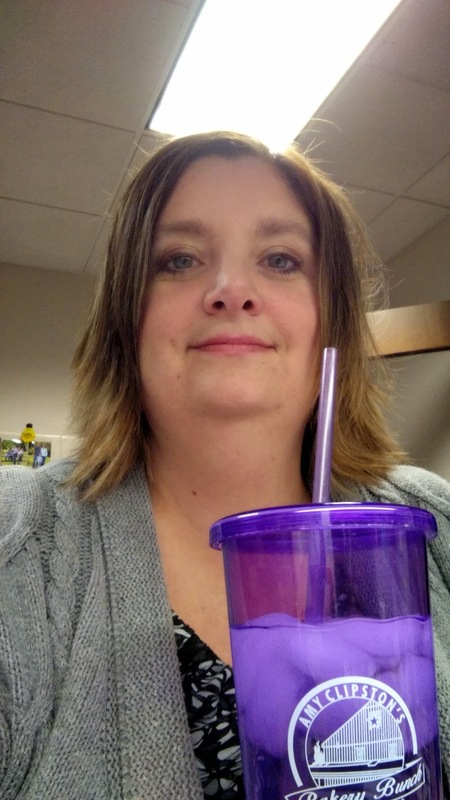 I have labeled this my "water cup", and it goes EVERYWHERE with me! The only thing I allow myself to put in it is water...it's a great way to get my daily water intake and to help promote Amy! 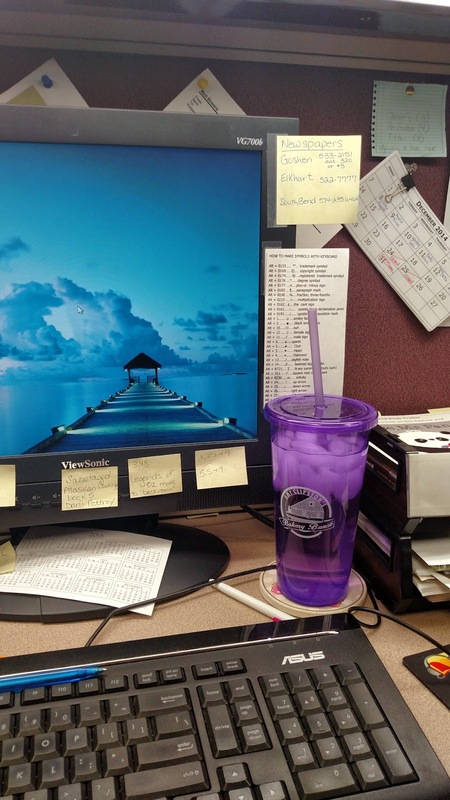 This is a picture of my desk at work...I think I may be the sticky note queen, but that is for another post. For those of you that may not know, I work at my local library. And guess what? 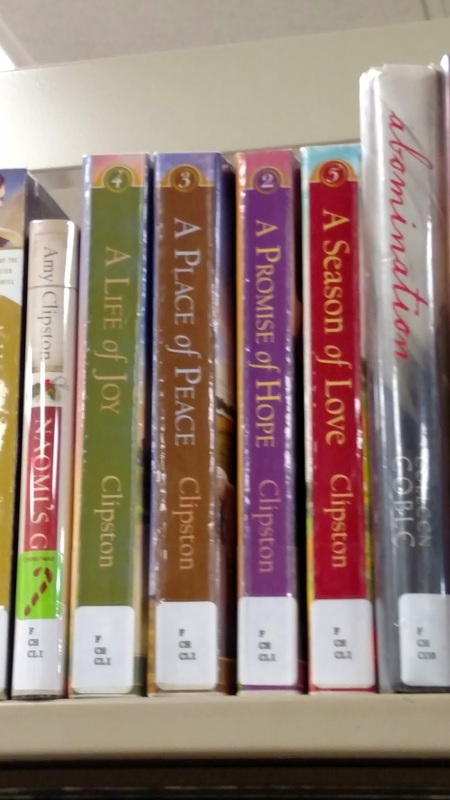 We have Amy Clipston books on our shelves! And not just a few, but 13 items! Her books tend to be pretty popular. I live in a small town, conservative community, and the patrons love reading Christian Fiction/Young Adult! This was a title that had just been returned on Saturday when I was snapping pictures! I'm telling you, they are constantly checking out...which means they are really good reads, right? 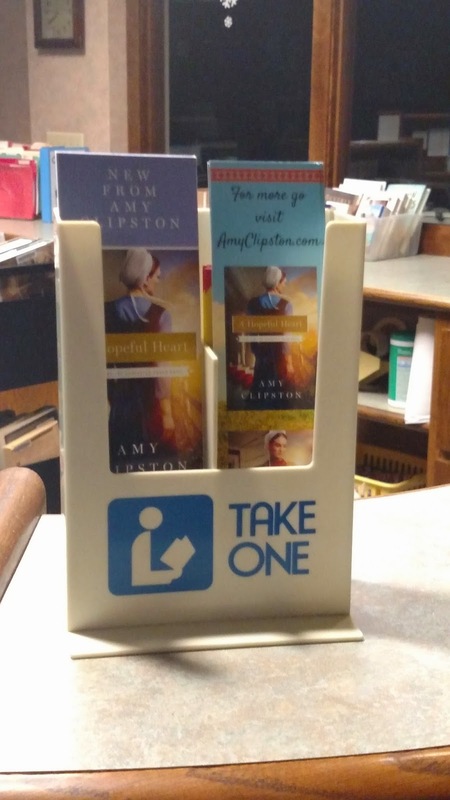 And just because I love to share, I stuck some bookmarks Amy sent me out in our bookmark display at the front desk. I personally LOVE having a bookmark to match the book I am reading. What fun! The moral of this post? 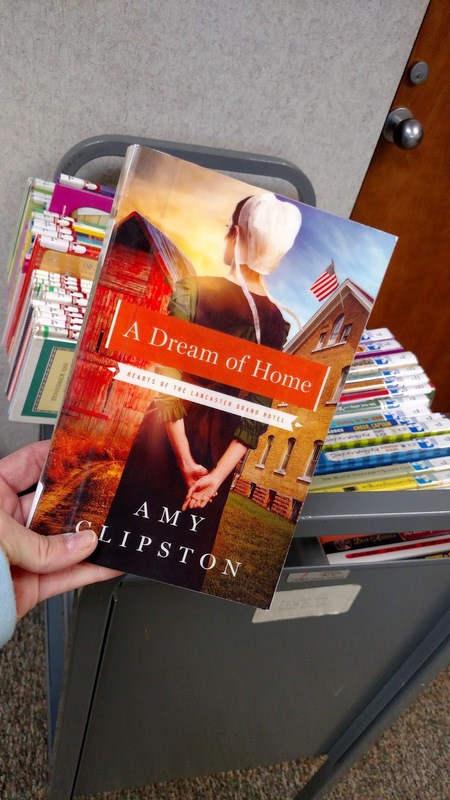 If you're looking for a great author to read, check out any of Amy Clipston's books. You won't be disappointed! Wonderful post, Shondra! Very thoughtful and attractive. This has been fun and I've enjoyed everyone's posts. Mine will go up tomorrow and I also used the water idea for my tumbler, but I didn't copy you - promise!! I've been trying to eat healthy and drink 8 glasses of water a day. I rarely make it, but Amy's tumbler helps.